This Halloween we were a little ahead of ourselves. From what I hear, Disney has a new princess animation planned for release next year called The Princess and the Frog. It is an animated musical set in New Orleans and is loosely based on the fairy tale The Frog Prince . Wish the costumes would fit again next year. Anyway, hope you had a happy Halloween! 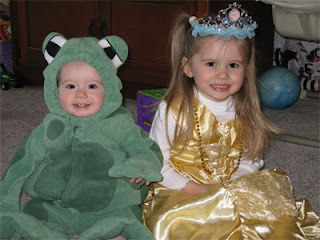 Enter your halloween photo to win at Island Life Halloween Photo Contest. What a PRECIOUS theme! They look adorable! They both look so cute!! Love their costumes!